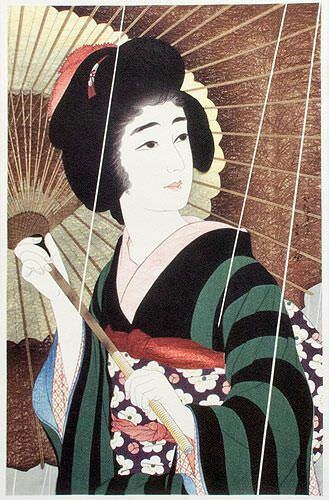 Artwork Panel: 28.3cm x 42.7cm ≈ 11" x 16¾"
This Japanese woodblock print reproduction features a well-dressed Japanese woman holding an umbrella or parasol. The title of this artwork is simply 雨 which means rain, and is pronounced and romanized as Ame. The original artwork was created in Japan around October of 1929. Torii Kotondo (鳥居言人) was born Saitō Akira (斎藤信) on 21 November 1900 in the Nihonbashi district of Tokyo. Torii's work was sometimes controversial. For instance, his print titled "Morning Hair" released in 1930 was deemed provocative by Japanese authorities and banned in the middle of the first printing (the last prints destroyed before sale). As with many great artists, Torii's work was undervalued and he was somewhat ignored during his lifetime. After his death in 1976, his original prints appreciated in collectability and fetch prices comparable to those of the great masters.